The ultimate sampler pack. This Mega Sample pack allows you try every one of Legacy's emergency food products and decide what you like. The 183-serving Mega Sample Pack from Legacy includes a sampler pouch of every emergency breakfast, entree, side, and drink (including coffee!) that Legacy Premium provides. Because it offers a chance to sample every item of emergency food storage that Legacy makes, the Mega Pack allows you to decide for yourself about our claims that Legacy Food Storage is the tastiest, healthiest, most affordable food storage in the emergency preparedness industry. A crucial part of making a food storage purchase is knowing that the emergency food you are purchasing is going to be food that your family will eat and enjoy in an emergency situation. The Mega Sampler Pack is designed to give you the chance to try everything on Legacy Premium’s menu so you can do just that. Sample every delicious meal, hearty entree, tasty side dish, and refreshing drink, and see for yourself what all the buzz is about with Legacy Premium. After you’ve sampled it all, you can then choose the entrees, sides, drinks, and breakfasts that you liked the best and call us to help you create customized emergency food storage buckets that are perfectly suited to fit your family’s needs and please their taste buds. The Mega Sampler Pack is also a great way to add variety and bulk to existing food storage. With 4 different breakfasts, 19 different entrees, 6 side dishes, and 5 drink options, the Mega Sampler Pack adds satisfying and nutritious food to your emergency reserves. 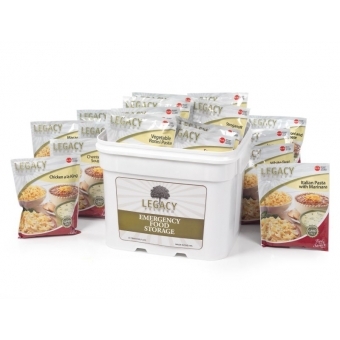 Best of all, Legacy meals are made with only high-quality ingredients, has an up to 25-year shelf life, and is the best value on freeze-dried food storage in the industry.